Adele‘s 21 has become the first album to sell over three million copies digitally. Released in 2011, the album topped America’s end-of-year sales charts that year and the following year and it was the 21st bestseller in 2013. It also became the 21st album to sell more than 10 million copies in the U.S. The Someone Like You singer and her producer Paul Epworth are reportedly at work on the album’s follow-up after Adele took time away from the spotlight to become a mother. The Night That Changed America: A Grammy Salute to the Beatles, which celebrates the 50th anniversary of the Fab Four’s U.S. debut performance on The Ed Sullivan Show in 1964, will air Sunday, Feb. 9, 2014, from 8-10 p.m. ET/PT, the network announced Thursday. Taping the day after the Grammys on Monday, Jan. 27, the special also will highlight the legacy of the seven-time Grammy-winning group. “An all-star line-up headed up by Sir Paul McCartney, Ringo Starr, Yoko Ono and George’s wife Olivia Harrison, along with some of the biggest names in music such as Justin Timberlake, Lady Gaga, Adele, Bruno Mars, P!nk and Katy Perry will gather to celebrate and perform the songs of The Beatles,” he said. British soul sensation Adele has given birth to a baby boy, according to U.K. reports. The Rolling in the Deep hitmaker and her boyfriend, Simon Konecki, welcomed a son on Friday night, reports the Daily Mail. No further details about the baby were available as WENN went to press. Adele, 24, began dating charity boss Konecki, 38, late last year and she announced she was pregnant in a post on her website in June. Konecki is also dad to a five-year-old daughter with his ex-wife Clary Fisher. The MTV Video Music Awards Nominees have been announced. The 2012 VMA awards will air on September 6th, so be sure to get voting on your favorite video. Adele‘s father is reaching out after learning she is pregnant, insisting he wants “more than anything” to be a part of her life as she becomes a mother. The Rolling In The Deep hitmaker announced last month she is starting a family with boyfriend Simon Konecki, and recent reports suggest she is due in September. The Grammy-winning singer’s dad Mark Evans, who split from Adele’s mother Penny when the star was just three, heard the news from his own mother and he has now urged his daughter to consider a reconciliation. He tells Britain’s Sunday Mirror, “Mom rang and said, ‘Mark, I’ve got some important news for you. Adele is expecting a child’. My first reaction was a surge of happiness for her. But as we chatted about how Adele had told her in person, it dawned on me that my daughter hadn’t wanted to tell me herself. My happiness for her turned to gloom because I realized I really was out of the picture as far as she is concerned. “I would have loved so much to have been able to hold her in my arms and tell her how happy I was for her. I want more than anything to be part of her life again and to be a big part in my little grandson or granddaughter’s life. Evans will have a hard time convincing Adele to reconcile. She previously admitted she was angry at her estranged father for airing his heartache in the press. Singer Adele Expecting Her 1st Child! Former Eurythmics star Annie Lennox has praised Adele after presenting her with an Ivor Novello Award on Thursday. 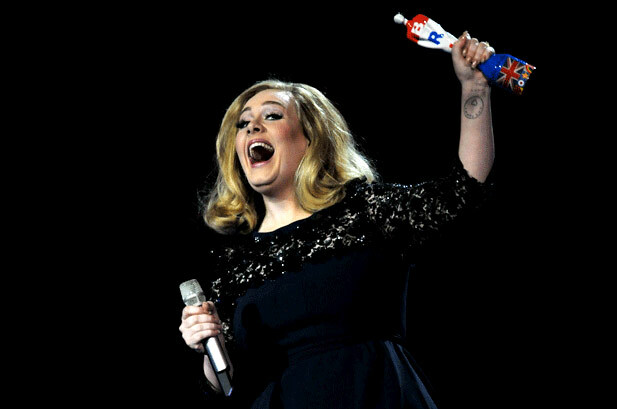 Adele was reduced to tears as she collected two of the prestigious trophies at the 57th annual prize giving in London. The star was named songwriter of the year and her trackRolling in the Deep was recognized as the most performed song of 2011, and Lennox has now reached out to fans to pay tribute to her fellow Brit. Taylor Swift Tops Billboard 2012 Top Money Makers! Lady Gaga, Katy Perry and Adele had huge years in 2011, with major tours, strings of hit singles, Grammy wins and #1-hogging chart-topping albums. But when Billboard magazine compiled its 2012 list of “Music’s Top 40 Money Makers” it was Taylor Swift who ruled them all. In fact, the 22-year-old country pop darling out-earned all of her fellow ladies combined. Rihanna, Bruno Mars and Adele were among the biggest winners at the Brit Awards, which took place on Tuesday, February 22 at London’s O2 Arena. Bruno Mars nabbed the masculine complement to Rihanna’s award, the International Male Solo Artist Award.